A lot has happened since 1944! Updated Monday December 10, 2018 by Kitchener Sports Association. PHOTO: There have certainly been a lot of changes (and progress) over the years. 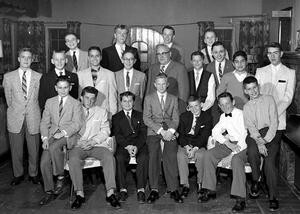 This is a photo (1959) of the "best" male primary athletes in the Kitchener area. KSA has helped a lot of athletes since then! Dwayne Herriot, triple jumper from Laurel Creek Track & Field Club and his coach, Janusz Tomko. Launch of Olympic Dreams Program, local Olympians & contenders! 15 Volunteer Recognition Dinner - NHL Kraut Line member - "Milt" Schmidt. Unveiling of The Kraut Line Monument in AUD lobby. Pat Stapleton, veteran NHL defenceman and stalwart on the blueline for Team Canada in 1972, addressed KSA with insight and humorous memories of the eight-game series. Sept.19/00 Subscribers L. 5oth Anniversary celebration of the AUD. "Time capsule" cermony & KSA plaque on Auditorium lobby wall. Nov. 16/99 Granite Club 11th Volunteer Recognition Dinner - Diane DeCoene, Principal of Kitchener Collegiate Institute. (KCI) and MC: Barney Lawrence, Q.C. Nov. 18/98 Subscribers Lounge 10th Volunteer Recognition Dinner - Don Cameron, voice of the Kitchener Rangers. M.C - Barney Lawrence, Q.C. Mar. 19/96 Granite Club Launch of the Scholarship program - overview, specifics, sponsors, etc.